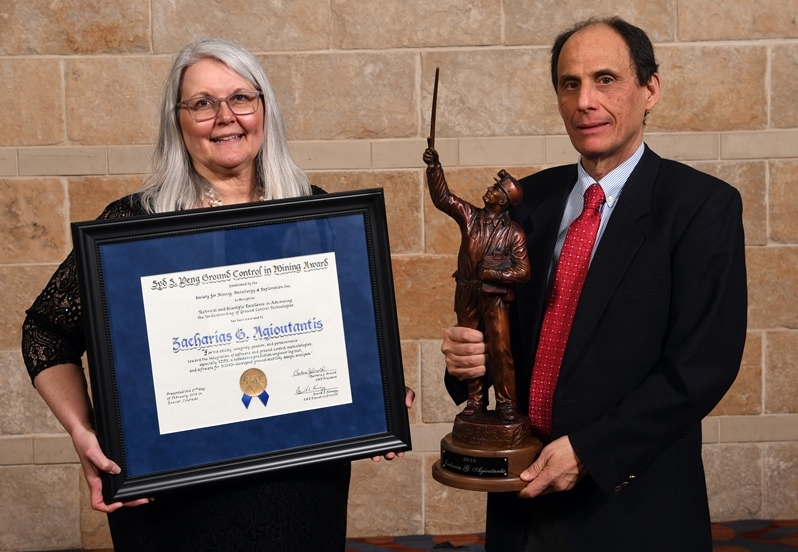 Zacharias G. Agioutantis, Mining Engineering Foundation Professor and Director of Graduate Studies at the Department of Mining Engineering at the University of Kentucky (UK), accepting his award from Dr. Barbara J. Arnold. "In recognition of his ability, integrity, passion, and perseverance toward the integration of software and ground control methodologies, especially SDPS, a subsidence prediction-engineering tool, and software for NIOSH-developed ground stability design analyses." The purpose of the award is to provide recognition to individuals that have demonstrated technical and scientific excellence in advancing the understanding of ground control technologies or approaches by either publication or direct applications in the mining industry. The annual award will be given to an individual or a group that: (1) has shown insight and understanding of ground control issues by developing concepts, theories or technologies that have been adopted by the mining community, or (2) has successfully implemented a ground control design or designs or practices. The award will be available to individuals/groups that have made such contributions to ground control related to coal and/or non-coal (metals, commodities, etc) or aggregate mines. In addition, in 2009, the Syd S. Peng Fund added two Ground Control in Mining Scholarships to promote the science of Ground Control. Recent trends in mining engineering professionals indicate a shortage of competent ground control engineers. To help remedy this situation and promote the ground control engineering discipline, an undergraduate and/or graduate scholarship(s) will be awarded annually to encourage the development of ground control engineers. Submission deadline: All nominations must be received as complete by SME Foundation by August 1, 2019.
awards@smenet.org or 303-948-4200 or 800-763-3132.